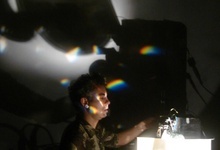 For the first Scratch Projection of this autumn season, Light Cone invites Xavier Quérel, experimental filmmaker, member of the Cellule d'Intervention METAMKINE and co-founder of Ateliers MTK, DIY film lab based in Grenoble. 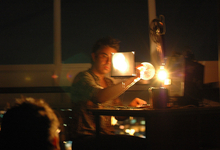 Xavier Quérel will present a selection of films from the Light Cone catalogue and a performance with SIMISKINA, a duo of improvisational musicians from Norway. Simiskina is a duo consisting of two young players from the Norwegian scene for improvised music. Their first album was released on CD and vinyl on the Portuguese label Clean Feed. The Norwegian Jazz Magazine Jazznytt called the album 'some of the best you can find in Norwegian improvised and free music. 'This entirely acoustic album consists of 10 minimalistic improvisations with multiple layers of ever changing rhythmic patterns, performed on prepared piano and double bass. 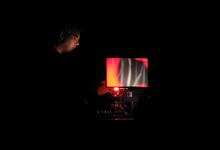 Simsikina is now performing its music on analog synthesizers, electronics and electric bass, and teaming up with french film maker and visual artist Xavier Quérel, known from the audiovisual noise-collective Metamkine. 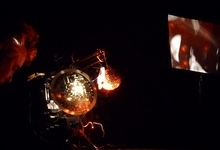 Xavier is included within Simiskina as a sort of third musician, working with images instead of sound. 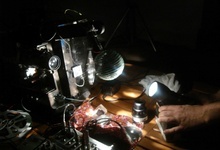 He is using a 16mm film projector, and different techniques to manipulate image and light, to improvise a film which is projected on a small screen, resulting in an intimate screening in dialogue with Simiskina's music.